Diversity Council 2018: A Q&A with Nadia Sahid - Enova International, Inc.
We sat down with Nadia Sahid on the People team to learn more about the Diversity Council’s expanded vision and plans for 2018. Q: First, I’d love to know more about you. Can you tell me a bit about yourself and why you chose to work at Enova and take on this role? A: Absolutely! I moved to Chicago in 2015 to complete my masters. Along with classroom learning, I craved real world experience within the field of Organizational Psychology. During my two-year program, I interned at WGN-TV, worked for a small consulting practice and prior to joining Enova, finished up a contract position at DigitasLBi. I chose Enova because quite honestly, it seemed like the perfect fit for me. The values at Enova and the role of Talent Developer checked off all the boxes for what is important to me. As an added bonus, the culture at Enova seemed super dope (which I can now wholeheartedly confirm). I get to work with amazing people and influence areas of personal wellness, lifelong learning, career advancement and Diversity and Inclusion. This is my dream job, and I could not be happier. Q: What does the Diversity Council have in store for 2018? A: Big things to come in 2018! The Diversity Council is so excited to roll out the new strategy that encompasses more areas of Diversity and Inclusion. We are focusing on the six nationally recognized months of Diversity. These include February: Black History, March: Women’s History, May: Asian/Pacific Heritage, June: Pride, September: Hispanic Heritage and October: People with Disabilities Awareness. We will also continue to celebrate Diwali in November, as we have done in the past. In addition, to be more intentional with our efforts, we are focusing on learning, celebration as well as community. We will also utilize additional tools to help supplement each Month of Diversity. There are awesome initiatives on the horizon! 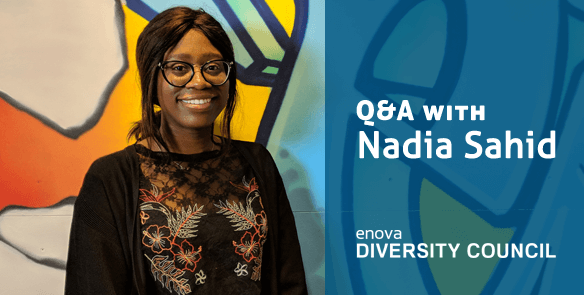 Q: Why is Diversity and Inclusion (D&I) important at Enova? A: Love this question. Here’s the short(ish) answer: Diversity surpasses being “the right thing to do.” The Diversity of our Talent as well as our Customers are what drive the business. It is differences in perspective and background that spike innovation and creativity, allowing us to be thought leaders in the industry. But diversity alone is not enough. At Enova, we continue to be inclusive of our varying backgrounds because working in an environment where we feel comfortable regardless of our race, gender, ethnicity, religion or sexual orientation allows us to perform at our maximum capabilities. If we were all the same, we would come to work with the same answers. But we don’t want the same, we want the best. That is why Diversity is important to Enova and how Inclusion brings us together, as One Enova. D&I is our Best Answer, and as we say at Enova, Best Answer Wins. Q: How can Enova employees get involved in Diversity initiatives? A: I’m so glad that you asked because Enova employees can join a Diversity Task Force for the Month(s) they are most passionate about! Task Force members will partner with the Committee Leader and Chair members to brainstorm ideas, help execute and promote awareness of events and initiatives, share resources and serve as D&I champions within their teams. ❮ You’ve Rebranded… Now What?